Magic Dirt™ ( www.magic-dirt.com ), a uniquely new and environmentally-friendly organic soil amendment and sustainable alternative to peat moss, has been developed by Cenergy USA and is being distributed to retailers in eight northwest states for the 2014 growing season. Magic Dirt™ has been certified as a Premium Potting Soil by the Mulch and Soil Council, certified as 100% BioBased under the U.S. Department of Agriculture’s BioPreferred Program and approved for organic production by the State of Idaho’s Department of Agriculture. Independent growth tests confirm the wide range of uses for Magic Dirt™. It grows healthy plants from seeds, nourishes transplanted seedlings in pots, and when added to gardens, helps keep the soil loose and moist. Magic Dirt™ is packaged in convenient one cubic foot clear recyclable plastic bags which show off the product’s rich color and texture. Magic Dirt™ is made primarily from a clean, fluffy, nutrient-rich fiber that remains after dairy and farm wastes have been heat-treated in an air-tight oxygen-free vessel for 20 days. The process is done exclusively in DVO, Inc.’s patented Two-Stage Mixed Plug Flow™ digester. The digester captures methane gas which is used to generate renewable energy, reduces greenhouse gas emissions, and makes the fiber used in Magic Dirt™. Every cubic yard of Magic Dirt™ is the byproduct of generating more than 100 kWh of renewable energy and removing over 1,800 pounds of greenhouse gases from the environment as a sustainable alternative to peat moss. [i] In addition, Magic Dirt™ provides naturally occurring organic nutrients without additives and a pH within 6-7 range. Laboratory tests show that the fibers in Magic Dirt™ will retain more than three times its dry weight in water.Unlike many other premium potting soils, Magic Dirt does not contain peat moss, coir, vermiculite or perlite, and unlike peat moss, which releases pollutants when harvested, the Magic Dirt™ process actually captures methane before it is released into the atmosphere. A recent study commissioned by the Innovation Center for U. S. Dairy, which was established by dairy producers, reports that the digested organic fiber that is in Magic Dirt™ “provides an environmental advantage in comparison to peat moss for all indicators examined.” There is more than enough digested dairy fiber available to replace all of the peat moss used in the U.S. annually[ii], most of which is imported. There are no imported ingredients in Magic Dirt™. It is produced and packaged in the USA. Fruit size: 2 to 3 in./5 to 7 cm long and about 1 in./2.5 cm dia. Imagine taking 250 tons of discarded glass bottles out of New Mexican landfills each month and turning them into high-performance horticulture products. No small feat. Yet, that’s exactly what Growstone ® does in their manufacturing plant located right in the middle of the Albuquerque landfill. control, drainage and soil aeration while adhering to sustainable practices, unlike other product in this category. The company’s newest product, Gnat Nix! ™ is a non-toxic fungus gnat control used as a top dressing. It is the only scientifically proven, chemical-free product that significantly reduces fungus gnats on plants, indoors or out. No matter where gnats are in their lifecycle, Gnat Nix! works – either by preventing the adult emergence from hatching larvae or deterring females from laying eggs. Growstone has also added the ultimate growing media to their product list. In keeping with the company’s mission to provide plant growers with high performance, sustainable products, GS-3 Coco Mix ™ is a blend of tripled washed and buffered coco coir, Growstones, sustainable Redwood Fiber and enriched with Mycorrhizae. GC-3 Coco Mix provides plants with a super aerated root zone that promotes unimpeded, strong growth. For growers that prefer to create their own mix, Growstone’ s Mix This ™ stones can be blended with potting soil, coco coir, peat or compost. Mix This! provides excellent aeration for a plant’s roots while helping to reduce problems caused by overwatering, as well as protecting against root rot. “Plants need air as much as they need water for optimum growth. Mix This! does both. It holds 30% of its volume in water and 50% of its volume in air after irrigation. That means that when blended with potting soil, Mix This! brings your roots all the aeration and fast drainage they need, while providing available water. It’s the best of both worlds,” says Dr. Paula Costa, Director of Research and Development. 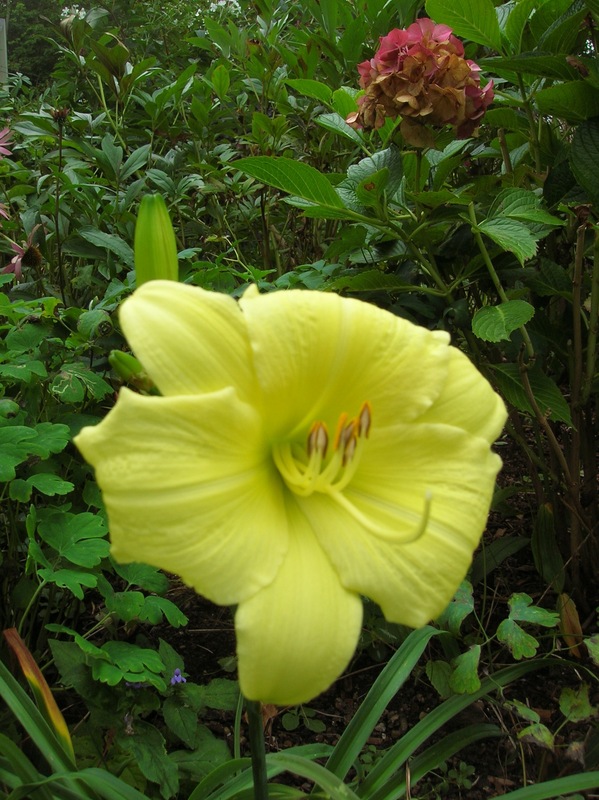 Sunny yellow has been on my mind lately — and foremost in that thought has to be the wonderful new daylily, ‘Going Bananas’ from Proven Winners. Aptly named, this hardy perennial goes crazy with thick, rich yellow blooms all summer long. I’ll repeat that thought — all summer long! Indeed this daylily is no one shot wonder. Repeat bloom is its tour de force. Well that and its incredibly rich blooms that are sure to enchant and compliment other perennials and annuals in the sunny bed or border. First Editions®Tiger Eyes® Sumac is capturing the attention of gardeners worldwide. Hardy and easy to grow, Tiger Eyes is different from other sumac in a number of ways. Tiger Eyes is considered a smaller variety, reaching a manageable height and width of just six feet. Most notable is Tiger Eyes’ stunning color. The plant’s new growth is a vivid chartreuse green, quickly changing to its glowing yellow summer hue. This spectacular color stays vibrant in even the brightest summer sun. In fact, it is the only true yellow plant that doesn’t burn. The leaf stems are a fuzzy purplish-pink and form a dramatic contrast with the lemon-lime foliage. As beautiful as Tiger Eyes is in the summer, its colors are absolutely magnificent in the fall as it turns a beautiful combination of yellow, orange and intense scarlet. Tiger Eyes’ branches angle upward, while the deeply cut leaflets drape downward, giving the whole plant a rather elegant, oriental look. This bold architectural quality lends itself to a wide variety of garden situations. Landscape designers across the country are creating amazing container gardens using Tiger Eyes as the centerpiece. It is a stunning specimen for mass planting, making a perfect transitional shrub between ˜wild” and “tame” areas of the landscape. It is wonderful in peripheral areas, giving privacy and good habitat for wildlife. It also makes a strong statement near the back of the perennial border. Tiger Eyes’ yellow summer color mixes well with perennials such as purple salvias, orange daylilies or red monarda, just to name a few. Combine it with asters for a stunning fall border. Tiger Eyes is rated Zone 4-8 and prefers full to part sun. This variety can handle average soil and is quite drought tolerant once established. It is the perfect plant for hot, sunny areas.